The Fire Prevention / Fire Code Enforcement Bureau Chief reports directly to the Fire Chief. The staff includes a (1) Battalion Chief, (2) Fire Captains, (1) Fire Prevention Specialist II, (3) Fire Inspectors. The responsibilities within this Bureau include all functions of fire protection and planning, from plans checks to field inspections of the heavy commercial development. Annually, there are 145 to 170 projects in progress. Schools, civic orgranizations, and public events are a large part of our public education section. On an average year staff will contact over 25,000 people with 60,000 pieces of fire prevention and education materials delivered. The Law Enforcement section is staffed by sworn officers who are Peace Officer Standards and Training (POST) Certified. They are responsible for fire investigations, evidence collection, case filing, civil cost recovery, and prosecution of criminal cases. The officer’s, on average, execute 12 felony arrests per year with successful prosecutions. 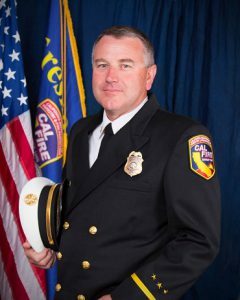 The Bureau provides technical assistance to other fire and law enforcement agencies; conducts internal investigations for CAL FIRE, the Fresno County Fire Protection District, and other associated law enforcement agencies.